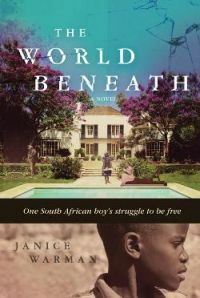 This young adult novel is riveted with suspense and fear, providing the reader with a realistic view of the danger and unpredictability of life in urban South Africa during the period of school boycotts and armed conflict, in the mid 1970s. The main character is a young boy, maybe 12 years old, who lives with his mother in the servant’s quarters at the back of the property where she works as a domestic house servant. He encounters and enables unimaginable situations, including saving the life of a black freedom fighter. Joshua, the child, learns firsthand about racism in his Cape Town environment. He sees how his mother is treated as a servant and he encounters racist and condescending whites as he investigates the white neighborhood where he lives. Racism in South Africa, known as apartheid, is quite well documented; young readers unfamiliar with the word will understand it by the end of the book. The author uses revealing words in her narrative. Mrs. Malherbe, for example, is the name of the bossy. “do-nothing” white woman who supervises Joshua’s mother. (“Malherbe” is close to a French word meaning “weed.”) Warman also makes good use of dreams to indicate the feelings and desires of characters. Warman introduces her story with a poem, “I Am the Exile,” by the famous South African poet, Dennis Brutus. His work serves both as an introduction to the novel and as a poetic expression of the themes within the novel. The story introduces the reader to the bitter facts of life for urban African dwellers; it does, however, tend to over-play the role of white South Africans within the historic struggle against apartheid. There were certainly sympathetic whites who risked their jobs and even their lives in standing against the system, but in this book, there seem to be too many white “comrades,” perhaps giving the reader the impression that the struggle for freedom was a very multi-racial effort. Janice Warman was born in South Africa; she knew the apartheid system from within. Although she now lives outside the country, her command of the details of life, for both privileged whites and subservient blacks, remains keen. Overall, I recommend this book with four stars; it is a “good read” and it tells an important part of South African history.